All we hear in marketing these days is data data data. Yet it looks as if only about a third of global executives are using data and analysis as the primary method for making big decisions. The rest admit that most of their decision-making is based largely on gut instincts. As was written in Forrester, there is still a lot of mistrust on the part of marketing leaders of big data, what we can do with it, and how it should be incorporated into business strategy. First of all, to understand the basis of how we use data for analysis, it’s necessary to understand our marketing funnel. Most of our efforts at Sisense are inbound, meaning we are trying to attract people to our website and create interest in our product this way. Below you can see a dashboard of our funnel (all numbers have been altered, so you’re seeing trends rather than real numbers). The first level you see is total created leads: anyone who fills out a trial form, or a quote request, or signs up to a webinar, requests a white paper etc. The second level is after some filtering has taken place, and the unsuitable leads have been rooted out – based on different criteria such as demographic, the type of action they took, etc. The sales development team then starts to work on these open leads by connecting to them, trying to understand their requirements, their pains, and what drove them to seek out more information about Sisense, and finally to see if Sisense is a good fit for their needs. If they decide that there is a potential for us to answer their needs these leads become marketing qualified leads or the MQL (green) level in the funnel. Out of these come the opened opportunities – those MQLs that have gone a demo or conversation with the Sales team. Of those, revenue only comes from those who are actually “won,” or sign a deal. Here’s a different look at the flow of leads through our funnel, that shows the funnel statistics. It’s essential to broaden the perspective of each of the moving parts of the funnel, to see how it’s progressing. You can see that filtering (top right) by looking at paid or unpaid channels or specific countries and other demographics you’ll get different results. It’s safe to assume for example that most leads coming from events are less warm to moving forward in the process, as opposed to those who visited our website directly. 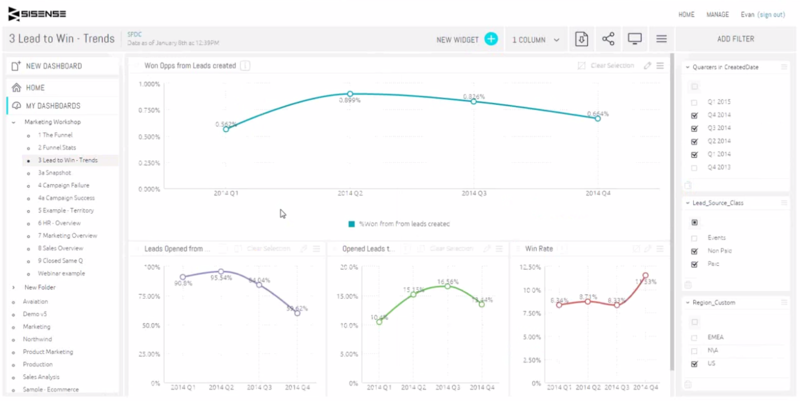 Viewing this same information in the form of trends, as you can see in the dashboard below, can lead to even more insights. For example in the bottom left corner, you can see that there is a downward trend for leads opened from those created. Though it might seem bad it can be a good thing. It’s a sign that we’re moving less leads through the funnel, but these fewer ones are better. We’ve managed to identify their intention in advance: it could be that we’ve visited a lot of events, or are trying out a new leads list, or there was a campaign that didn’t work. One of the things we do here is use more than just information that’s present in Salesforce. We create and regularly use dashboards that rely on data coming from multiple sources, as this is what deepens and invites the most interesting insights. This could be for example using Salesforce in combination with AdWords, or with our HR system. So up to now we’ve talked about high-level data and looking at the big picture when it comes to marketing data. The following is an example of a more concrete, day-to-day case of how to base actionable decisions on insights. What you see below are examples of two campaigns, one that failed, and one that succeeded. First of all, note that each of these columns goes back to the funnel, we are always looking at the same broad groups, here in terms of costs: first number of leads, MQLs, opportunities, and then costs per lead, cost per MQL, etc. Let’s start with the failure. This was a campaign that was launched a few months ago, one that we spent a lot of time working on, and one that we felt would work very well. At first it was also going in the right direction, there was a quick win, and everyone was happy with what was happening. But when we went back and looked at it after some time had passed, as you can see, we spent a lot more than was gained in revenues. We decided to break it down and see if maybe the whole campaign isn’t working, or just a specific ad group. We looked to see where the revenues are coming from, maybe the cost per opportunity (CPO). This was an AdWords campaign and the information in the above dashboard was created from pulling data about it both from AdWords and Salesforce. If we had looked only at AdWords we actually would have gotten a false positive about the campaign. This is because AdWords can show you if the campaign is leading to lead creation, but it cannot show you if these leads are turning into sales. We always start analyzing a campaign by looking at a specific source of information, ours at first was AdWords. There we saw that the number of leads, the cost per lead, etc. all made sense. All the basic things were working, but this wasn’t the whole picture. Once we added in the full information from Salesforce, that showed us if the new leads were becoming sales, we were able to see if the campaign was making the company money. 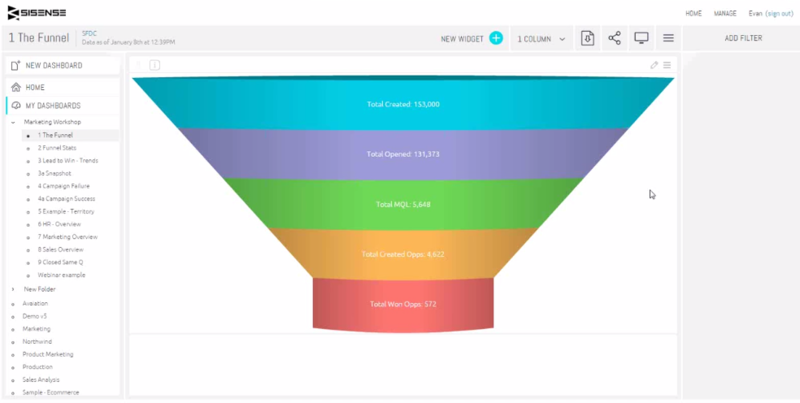 This next one is a funnel overview dashboard. Again going back to our basic funnel, this time broken up by quarters. This is a much more executive overview, and not the type of dashboard that everyone in the department is using daily. Watch Saar Bitner, Sisense CMO, give a webinar on “The Data that Drives the Marketing Funnel”. Or, for a more hands-on experience, download a free trial of a powerful marketing analytics tool.